Protests demanding the ouster of Mizoram Chief Electoral Officer S B Shashank were called off by the NGO Coordination Committee on Wednesday after the state election official left for New Delhi after being summoned by the Election Commission. The protests were called off at 1 pm after the CEO left Aizawl city for Lengpui airport, NGO Coordination Committee chairman Vanlalruata said. The CEO left for Delhi by the evening flight. Earlier in the day, Shashank said he had been summoned by the Election Commission and he would meet the poll panel in the national capital on Thursday. 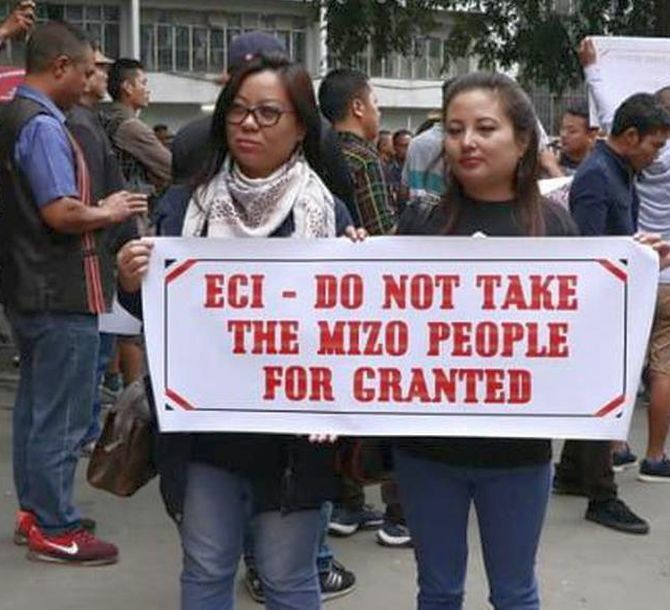 The agitation demanding his removal had been launched on Tuesday and resumed Wednesday morning by a large number of Young Mizo Association members in front of the CEO’s office from 8 am. The protestors later dispersed. The assembly election in Mizoram is scheduled for November 28. Vanlalruata said the coordination committee would wait and watch the decision taken by the Election Commission of India on the CEO. “If Shashank comes back, the agitation will be relaunched,” Vanlalruata said. The NGO Coordination Committee, the apex body of civil societies and students’ organisations in the north-eastern state, has been demanding that Shashank be replaced and transferred outside the state. The committee had called for Shashank’s exit from the state shortly after the Election Commission removed the state’s principal secretary (Home) Lalnunmawia Chuaungo. He had allegedly sought deployment of additional central armed police forces in the state which did not go down well with the committee. The meeting of a visiting three-member EC team, state government officials and leaders of the NGO Coordination Committee on the current standoff here Tuesday night remained inconclusive as the team said the final call would be made by the commission. The agitators are also protesting against the removal of Chuaungo, a native of the state and Gujarat-cadre IAS officer. In the past too, the civil society organisations had opposed the Election Commission’s decision to conduct electoral revision of Bru voters in Tripura relief camps. Is Election Commission ready for 2019 polls?